We went to Irene’s, located 608 Main St in Bradley Beach after the Starving Artist in Ocean Grove had a wait of over an hour due to the post-Church rush. Now we know to check out OG on any day/time except for Sunday 11-2. Irene’s is a classic diner including some Greek options. Unlike most diners though, they close after lunch. This was my second visit. Both times waitresses apologized, saying that they just got slammed though appearing only moderately busy. In reality the wait probably wasn’t that long but as we all know hungry + angry makes everyone hangry. The ice coffee was served in generous imperial pint size so that certainly helped to assuage us. Eventually I ordered the pastrami reuben. The portion was fantastic. It was served open faced with a heaping amount of pastrami. The part I disliked was that there wasn’t much Russian dressing. Instead there was a heavy dose of mayo. 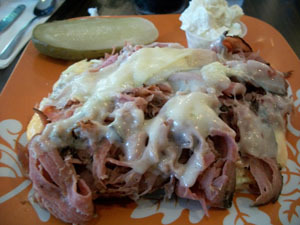 In a reuben you need the tart/sweet from the Russian (or Thousand Island). Perhaps extra flavoring was provided by hunger but by the end I was enjoying the meal though I would not get it again. I recommend simple eggs, homefries and toast and weather permitting check out their outside area. I’ll definitely be going back but only pre- or post- rush. See previous posts of Delponte’s and Cool Runnings also in Bradley Beach.